Deer Drives can be a very effective means of bringing those big bucks out from their core area in times when these big bruisers are holding tight due to heavy hunting pressure. A deer drive holds many aspects to consider such as wind, the terrain to be driven, number of hunters and drivers in the party, and more. The main consideration when driving deer is safety. When you sorround a piece of property with hunters, waiting to shoot at a running deer, the excitement reaches a fevered pitch and heartbeats run rampant. In this 2 part series we’ll discuss all the factors listed above in an effort to provide you with some beneficial information to execute a successful deer drive. While many hunters would debate that driving deer is an unsafe practice, it’s hard to deny that this is an effective means to harvesting those deer that survive by keeping themselves out of sight during daylight hours. In this article I’ll give a few scenarios from actual deer drives, some set-up advice, techniques, and of course a safety lesson. A good friend had called and explained that he had yet to connect with his buck and the season was nearly over. The area he hunts is rich with farmlands and holds deer of every proportion imaginable. Honestly, I was surprised he hadn’t filled his tag with a nice buck on opening day like he had so many times before. He was interested in driving a small 20 acre swamp on his property and was sure the bucks were holding tight in there throughout the day. I was familiar with the tract of land and recognized the possibility of driving the swamp using the wind and natural landscape to our advantage. The truck was loaded with gear and I began to create a mental blueprint of how the drive would take place as I headed down the backroads. At the farmstead I was greeted by an anxious hunter with his own ideas on the technique we should use to drive the intended woodlot. We pooled our resources and decided on a drive that accomodated both our ideas. I had the knowledge of the drive and he knew the layout of the land down to the smallest detail. We planned on driving the deer from the north end to an open powerline on the south end. There were 2 major trails the deer used leading into an adjoining woodlot that he was sure the deer would use for their escape. The powerline itself might be 15 yards wide at the largest so our approach to driving the deer was to be more of a “silent push” to allow a decent shot while the deer crossed the opening. A “silent push” is what I refer to as stalking through the woods like you’re hunting without worrying about every little twig cracking but still trying to avoid the larger limbs and sharper noises. You use the wind to your advantage whenever possible by driving the swamp with the wind to your back. You want the deer to scent you but not necessarily recognize your exact location. This will force the deer to keep ahead of you but usually not send them into the next county on a dead run. When using this technique, more times than not the deer will use their best trails to make their own silent escape. If all worked well the deer shouldn’t be in a major panic and try to sneak across the powerline exposing themselves for a clear shot. The landowner positioned himself with easy viewing access of the two main trails as I headed for an old tractor trail that disected two adjoining parcels. The sky was mostly cloudy, the day was in the low 40’s, there was a strong prevailing wind from the north, and we knew the deer were bedded down in between us. We couldnt have asked for a better scenario considering the drive only consisted of 1 driver and 1 man posting for the shot. I remember deer drives from back when I was just a mere spectator from a distance tucked safely inside a vehicle as an army of men discended into the woods. What followed sounded like a bar-room brawl straight from an old western movie as all kinds of hootin’ and hollerin’ began and anxious hunters, posted on the edge of the field, squatted down with rifles ready for the sea of deer that was sure to vacate the woods at any moment. More times than not very few deer made an appearance. This was how many hunters drove the woods and still do to this day. Most times there is no planned strategy besides the use of manpower. What you might lack in manpower you make up by creating as much noise as possible. I honestly thought “that was the way” back then but looking back it’s easy to see that the results could have been much higher even with the use of less manpower. I cant recall the wind directions from that many years back but, thinking of the property and the time of the year along with the prevailing winds, its easily recognized that these groups paid little attention to wind direction. If you think logically about using wind direction to your advantage it makes perfect sense. What gives you away to the deer more times than anything else while hunting? Exactly! A deer can be well out of sight and still catch your scent. All you see is a white flag bouncing between a few trees here and there and your opportunity to harvest that deer in particular just decreased dramatically. When using the silent push as described in the intro, I seldom have a deer blow or sound any type of alarm to the rest of the herd. On that same note I seldom see the deer I am driving for the hunter unless one tries to double-back around me. Speaking in terms of safety, the only “safe” shot I have while driving is either to the side, or behind me, unless there are other drivers in the party flanking each side. In these circumstances your only safe shot is directly behind you. In the heat of the moment when a buck breaks from heavy cover it can be difficult to hold your composure. I strongly suggest that your hunting party be chosen carefully for any type of deer drive. If you’re not 100% comfortable with any individual in the part, dont give them a gun. It’s that simple. The mere presence and added scent can be just as much of a weapon as any firearm. In fact, I have been on several drives when I opted not to take a firearm along. Remember, you’re initially trying to drive the deer to a designated hunter on the other end. Realizing the shape and terrain of your property is a great benefit. Most people take a one-dimensional approach to the size and shape of their own land and probably never realize the natural funnels and obvious escape routes used time after time. If you really want a clear look at the finer attributes of your property you can hire a pilot for a fly-over and take a few pictures. A more timely and much less expensive procedure would be to purchase some topographical maps. These maps will show not only the size and shape of your parcel but also the terrain elevation. It’s easy to spot areas where deer will bed on higher ground or even find open areas that might be suitable for a mini food plot. Many of your deer drives can be centered around your hunting party studying these maps, marking escape routes, and also placement of hunters and drivers. A great resource for online mapping is MyTopo.com which precisely pinpoints elevation, land mass, even water. For just a few bucks and a few minutes of your time these maps can created and laminated, suitable for any wall decoration for future reference. The biggest concern when driving deer is always safety. When you have a group of hunters sorrounding a relatively small piece of property, its easy to see where an accident can happen. And accidents do happen! Keep in mind that you probably will have a group of hunters all moving in one general direction, at one time, except for those who are posted on the most outlying boundaries where the deer are expected to appear. There should be unquestionable safe shooting zones for each member of the party. These zones will depend upon how you set up the drive but here is a typical set-up for 5 people driving a parcel of 20 acres. Your main shooter will posted in the highest percentage area which is normally the furthest away from the beginning drive point and a clear shot to the major escape trails. His main safe zone would be parallel to the direction the drivers are facing. There should also be 1 man posted on each side of the parcel where there are clear openings such as fields. These two men would have a direct line of fire limited to that only directly in front of them in the event a deer slips out an unexpected side door. The drivers would optionally have firearms. In the case where the men posted to the sides of the parcel are stationary, the driver would only have a safe shooting zone directly behind them and should be limited to smaller caliber firearms such as shotguns. All hunters should wear there necessary amount of hunters orange where applicable and even when not required by law, it’s a good idea that the drivers of the party where orange while in the woods. This will allow the drivers, 2 in this case, to move forward in unison. Its very easy to lose track of one another when in dense brush and the use of hunters orange will help quickly identify where your partner is at all times. The drivers should proceed to the predetermined destination but stop just short of entering the main shooting zone of the hunter posted at the end of their drive. An “all safe” call could be used at this time which can consist of a whistle or a verbal announcement. At this time the hunter should also identify himself to the drivers. It’s very important that even when someone discharges their firearm that the drivers continue on their path. There may be many more, or possibly even bigger bucks, being pushed forward or to the edge for the next hunter. To keep the whole drive safe for everyone all parties must stick to this pre-determined plan even if they have already shot a deer and are anxious to have a closer look. This is the fun part of the drive where everyone from the party gets together and compares notes. No doubt that someone will have seen, or maybe shot, a nice buck pushed from the parcel by the drivers but its time to also discuss how well the plan was executed. It’s a good idea to log how many deer everyone saw during the hunt, what trails they used, how the deer reacted, and if any changes should be made for the next drive. The more information you gain from a drive the better. All in all driving deer is usually a sure-fire way to see deer and maybe get a crack at that trophy of a lifetime. When all aspects of the drive are completely thought out you can safely, and effectively, drive deer from their bedding and core areas with as few as 2 people at times. 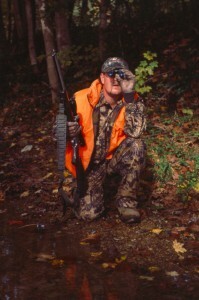 As I entered the woods I knew that it would be some time before my hunting partner would even see a deer. I hoped that the anticipation would keep him alert to what might prove to be a quick shot along the powerline. I informed him that many times I have witnessed that the does will be in more of a hurry vacate the area and the bucks will seem to linger along the wooded edges watching their backtrail. With this in mind and the fact that I had 400 yards to cover I found the most well used trail leading into the direction intended. As I covered the first half of the parcel I envisioned deer running to the edges of the field. With no hunters posted in that area, I hoped that the plan we decided on, along with his knowledge, would give us the advantage we needed to execute this drive successfully. Another 50 yards passed when I heard the distinct sound of a branch crack ahead of me. This was reassuring that the wind was definitely working for me this time and the deer were moving in the expected pattern. After another 50 yards I had heard more branches breaking along with the sound of hooves on hard ground but I had yet to see a single deer. With 100 yards to go my heart began to race in anticipation when a shot rang out and I heard deer running everywhere. I slowly continued to our meeting place keeping alert for deer that were probably now doubling back on us.